Our local club has three railroad projects - an indoor HO layout, an outdoor 24 inch gauge park railroad, and an HO modular layout. Unfortunately the modular layout has been unused for some time. But with a new club president, I guess we're going to dust off the modules and try to get them running again. The blue line is the mainline shared by all modules. The brown line would be mine exclusively. It will be HO standard gauge, I'm thinking code 75, with a 6 inch minimum radius and a maximum grade of 4%. I'll be running little 4 wheel cars, with small 4 wheel locomotives. I have a brass Joe Works 0-4-0 porter, and a Grandt Line 4 wheel box cab diesel. I also have an old SPUD unit that I intend converting into a railbus. These all should have no problem with the 6 inch radius. My trains will probably be no more than two cars and a caboose, so the grade shouldn't be a problem either. Why the Irn Bru line? I was reading the history of this Scottish beverage - I guess before WWII it was called Iron Brew, but after the war the government called them on it saying it didn't have any iron and it wasn't brewed, so they changed the name. I decided to solve the problem by providing an iron mine, and brewery - but I'll keep the new name. In the lower left is a station platform between the two lines. Since the RS Ry is 2 inches above the mainline, it will be a two level platform served by a small two story depot. On the other side of the track is the brewery. Up on Irn Mtn. is the mine and another platform. Also there will be the ore tipple and the pumping facility that takes water from Rusty Springs - all to be delivered to the brewery below. Inside the mountain will be something of a small fiddle yard where I can stage and remove trains. There will be no shunting or switching on the visible portions of the line. I wanted to keep this simple and show-friendly. I've had similar layouts before at shows that simply ran round and round, and they've always drawn large crowds. I believe it is a winning formula. It will also give me a chance to model small and varied scenes. I'm still building the Ffarquhar Branch - this will be done in off times, so progress will be slow. But I would like to have it up and running by the next show. I like the idea of a self contained operation independent of the modular layout's main line. A six inch radius though? 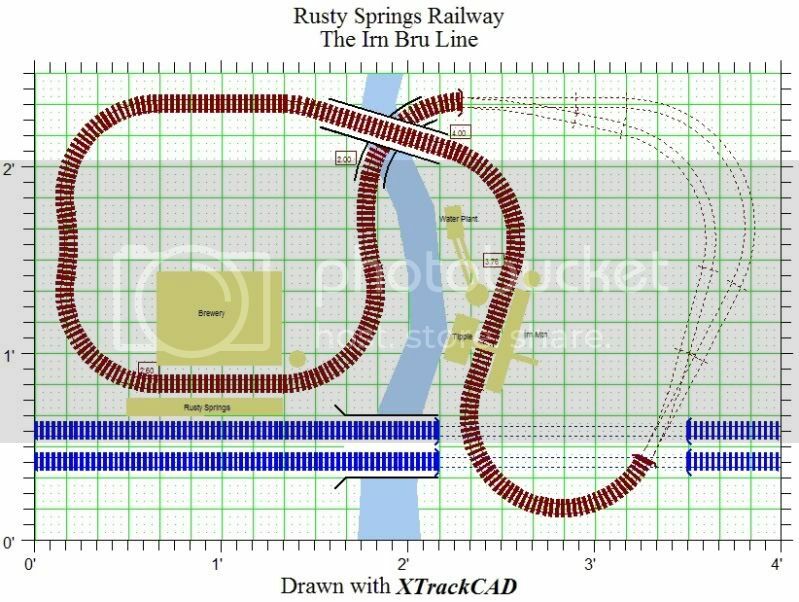 That's not a lot more than the length of a 40ft boxcar, are you going to hand lay the track so the gauge can be eased out a bit on the tightest curves? They're gonna squeal! "Irn Bru, made in Scotland, from girders" used to be the advertising for the sickly sweet brown liquid. When my sister worked in Fort William I stayed with her for a weekend and we went out for a meal with one of her work colleagues. He introduced us to silver birch wine, a deliciously dry white made from the sap of the tree. "Silver Birch, made in Scotland, from trees". The wheelbase of the cars run 1.2" with a total body length of 2". The Joe Works loco has a 0.8" wheelbase but a total length of 2.5" (vertical clearance is 1.8"). I've been studying the mini-layouts on Carl Arendt's site and it seems a 6 inch radius is fairly common. You just have to be a little thoughtful about clearances. The Irn Bru I've seen here is a bright orange. I wonder if they've changed their formula? Also, I discussed this project with the household manager and she thinks it's a good idea. So I may actually get a start on it fairly soon! "It's Scotland's other national drink!" One of my friends went to school with the son of the owner of Irn Bru. He hasn't said anything about the orange colour. You want to see the alcoholic versions sold to kids who are (in some cases) old enough to drink but not yet wise enough to drink beer. It looks disgusting. The bright blue version is even worse. Maybe orange is a better discription of the colour than brown. But there's certainly no relation to the fruit of the same name. I recently saw an advert for the alcoholic version which said it's the same colour as a footballer's wife. I had no idea there was an alcoholic version. I've only seen it at Scottish Games in the US, and of course, when I was in Scotland in 2005. I've only just had a small sip - didn't really care much for it (too sweet) - it's a favorite of my son. In the pubs I generally bought Guinness. I checked with our local importer and they carry it - so I may bring some to the shows and offer small paper cups to the kiddos so they can try it. Just spotted this layout concept. Like your ideas for it. Have you taken it further? Anyway, I still like the concept, so I am thinking of a small shelf switchback layout based on the Gum Stump & Snowshoe Ry. When that layout first appeared in Model Railroader, I was so taken with it, I built a version - my first HO layout. It was a lot of fun and I would like to recapture that. It would be small enough to take to shows, if the opportunity arises. Good News! A good friend of mine has accepted the position of Module Coordinator in our club. He is very much into doing shows (he has two show layouts - HO & N - that he currently takes to shows) so the module effort is back on. I have some work to do cleaning up the family room which is also my model room, and then I'll be starting work on this again.